SHORTLY BEFORE WORLD WAR II and the German bombing of London, Graham Greene, the author of Orient Express and The Third Man, rented a room in Mecklenburgh Square to use as a writing studio. The room was let by two women, a mother and her adult daughter Dorothy Glover. Greene and Glover became lovers and lived together for much of the war, each working as fire spotters and Dorothy as a bomb shelter warden, while Greene's wife Vivien and their children lived in safety in Oxford. Greene felt tremendous guilt over his infidelity with Dorothy, but he admitted, even to his wife, that Dorothy was one of the great loves of his life. They remained a couple for over nine years. Their relationship ended much as it had begun: Graham Greene fell in love with another woman, Lady Catherine Walston, and began an affair. And like the guilt he felt for his infidelity to his wife, he harbored a similar guilt for his infidelity with Dorothy. By this time the war was over and Greene was working as a publisher at Eyre & Spottiswoode. Aware that his abandonment of her removed one of her financial supports, Greene signed on Dorothy Glover, working under the name Dorothy Craigie, as a children's book author and illustrator. 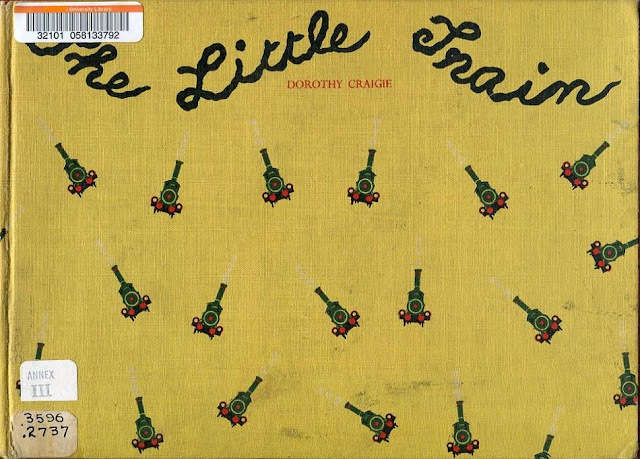 Her first book was to be The Little Train (1946). Only, Dorothy Glover had not written The Little Train. Graham Greene had. READERS OF CHOO CHOO: THE STORY OF A LITTLE ENGINE WHO RAN AWAY (1937) by Virginia Lee Burton and The Little Red Engine Gets a Name (1942) by Diana Ross will recognize the story. 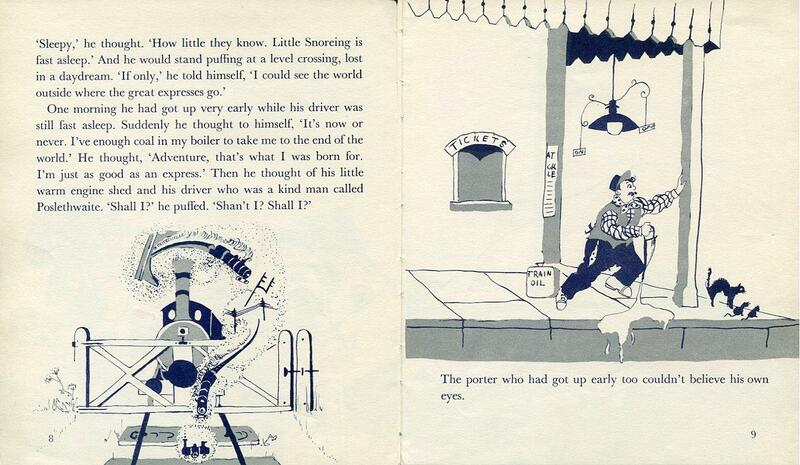 "The little train had lived all his life at Little Snoreing." And while the picturesque town depends on him, he is bored with the little town and longs to go "see the world outside where the great expresses go." Early one morning the little train takes his chance. He tears out of the station at Little Snoreing as fast as he can (a whole twenty-five miles an hour). He passes a foal, a hedgehog, a turtle, an express train, over a bridge beneath which are steamboats, a castle where a king had once been killed, "'Miles and miles and miles,' thought the little train." He ends up in the mountains. "In that desolation the little train began to long for the friendly whistle of the guard, the tapping of the platelayers, the hooting of the little foghorn." His mood lifts as he leaves the mountains, and then at last he makes it to the great city of Smokeoverall. There he is instantly overwhelmed by the rush of sights and sounds. "Nobody had ever told the little train that the world could be like this." In a panic, he goes into reverse (as a train on the tracks, he can't turn around). He goes through stop lights and switch points losing his head and losing his way. He is almost out of coal, and he wonders what nice little train will replace him back at Little Snoreing. 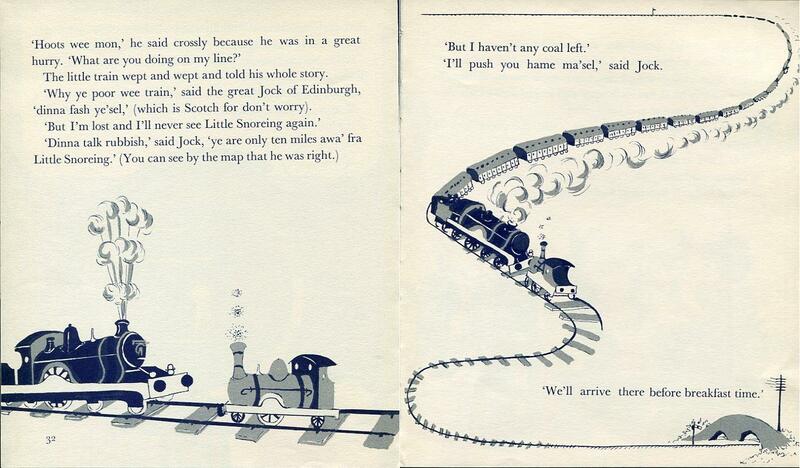 But then he finds himself face to face with "the great Jock of Edinburgh, the famous Scotch express." "'Hoots wee mon,' [Jock] said crossly because he was in a great hurry. 'What are you doing on my line?'" 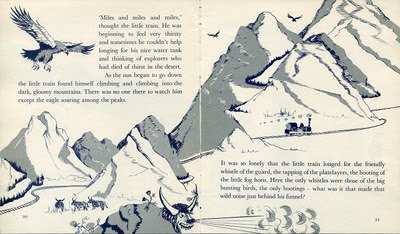 The little train explains his adventure and how he will never see home again. But Jock tells him that he is only ten miles away and then offers to push the little train home. Back in Little Snoreing, the townspeople are so happy that the little train is home that they have a celebration in his honor. THE LITTLE TRAIN was the first of four picture books that Graham Greene and Dorothy Glover published. The second, The Little Red Fire Engine (1952), was completed and on its way to production when Greene had a falling out with the previous director at Eyre & Spottiswoode (who was still at the firm) and as a result left the company. He negotiated an agreement with his former employer to allow the book to be published by Max Parrish. 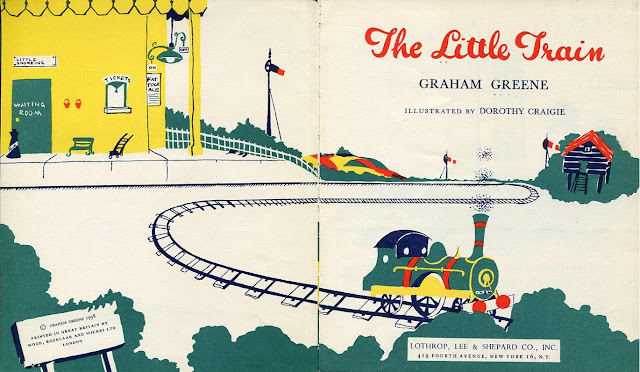 As part of that agreement the book was to appear under Graham Greene's own name, and so when The Little Red Fire Engine was released, it included a blurb on one of the jacket flaps that "it can now be revealed" that Greene was also the author of The Little Train. This revelation was no doubt also brought about as a way to provide Dorothy Glover with some financial stability as Greene had become a bestselling author whose name would guarantee sales. By 1957, Greene and Glover's books made a nice set, and to emphasize the books as a series, Max Parrish acquired the rights to The Little Train and had Glover rework it to fit the trade design of the last two books. This involved shortening the book from forty-eight pages to thirty-six, and alternating four-color illustrations with two-color illustrations. To do this Glover had to redraw many of the illustrations. Greene made very slight alterations to the text. The one of most interest appears when the little train is in the mountains. 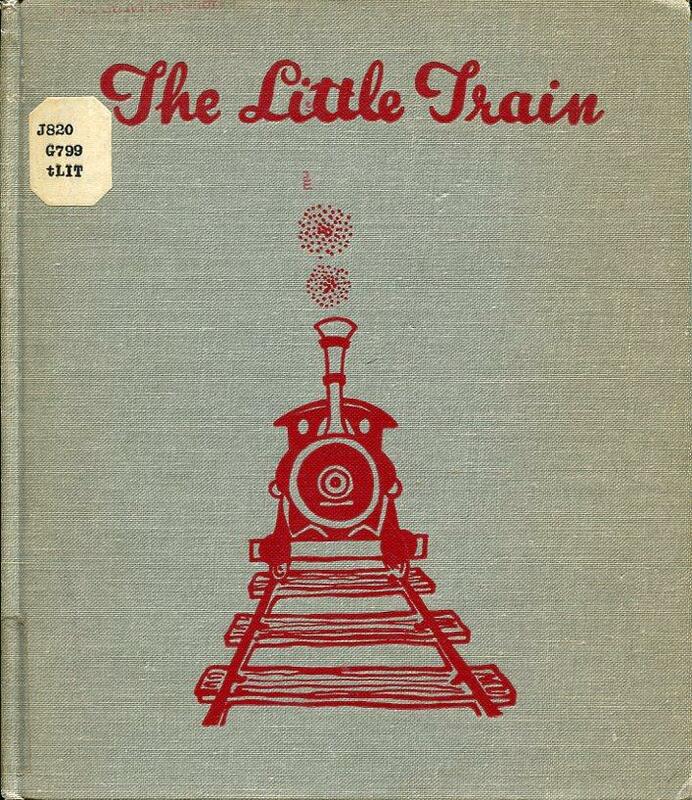 Instead of "In that desolation the little train began to long for..." Greene softens it to "It was so lonely that the little train longed for..."
But by this time, Greene had very little to do with Dorothy and it is unclear how involved he was in the reissue. Even though their relationship had ended, however, Greene remained protective of her. 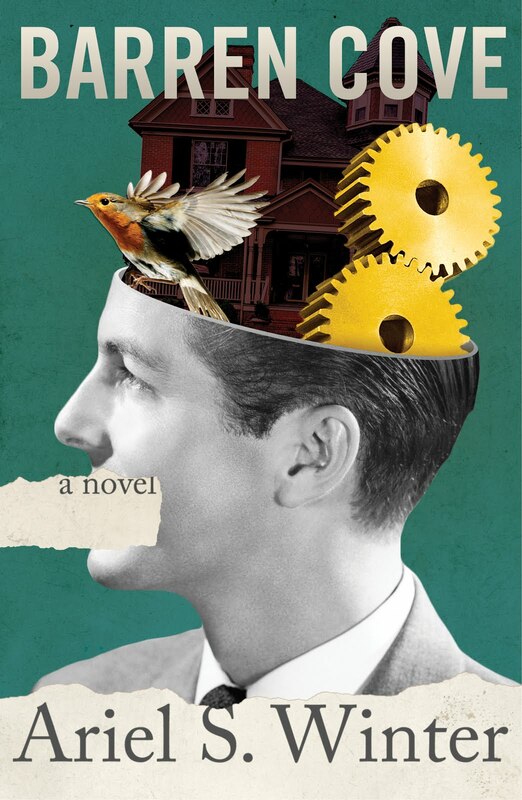 When approached by The Bodley Head to reissue the picture books with new illustrations, Greene refused. It was only after Glover's death that he allowed the books to be re-illustrated. 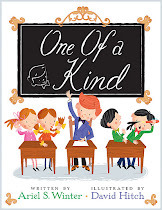 Creator of the Tim series (and one of Greene's friends) Edward Ardizzone was chosen to do the job. His illustrations are warmer than Glover's illustrations (though not as striking), and his layouts owe much to her. Ardizzone edition (1973). Note the return of "In that desolation..."
Even these later editions quickly fell out of print, and it is not quite surprising. While adequate, Greene's story has been told before and better (see above). But it is a shame that Dorothy Glover's vibrant illustrations have also been forgotten, relegated to a footnote in Graham Greene's life. I of course consulted Norman Sherry's three-volume biography of Graham Greene (Volume Two in particular) for the background information in this post, but the bulk of the material was heavily borrowed from Brian Alderson's article The Four (Or Five?... Or Six?... Or Seven?...) Children's Books of Graham Greene, which appeared in the December 2005 issue of Children's Literature in Education. Fascinating. I'd read a bit about this in the Norman Sherry biography, but it's lovely to see the pictures. Not surprising Greene felt guilt over Dorothy; she never married or had children, and ended her days as an alcoholic.